A 1920s flapper who haunts her old house possesses a reserved housewife who just moved in. However, she cannot leave before she receives her massive audition for a Hollywood studio. Vet: Do you know what the most important thing is to an infantryman? Col. Margarethe Cammermeyer: His weapon. Vet: His Buddy. You can be my buddy and share my foxhole any time, Colonel. This TV movie co-produced by Barbra Streisand gained controversy because of a kiss between Glenn Close and Judy Davis. It's hard to know why since it's not the first representation of lesbianism on TV and the kiss itself looks pretty strained. 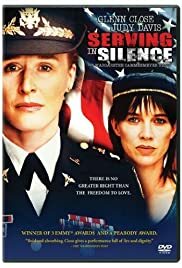 Director Jeff Bleckner presents Close as a real life Washington National Guard nurse who is discharged from the Army for `immoral conduct' after revealing her sexual orientation, although she argues that her relationship doesn't incorporate `conduct'. What we see is a lot of intense eye contact between Close and Davis as her artist girlfriend and a fair share of hugging, though Close tends to hug practically everyone she meets. Davis is presented as the ideal femme partner. She's supportive, she says all the right things, the family likes her and she is funny, particularly when she is outed `on prime time'. The script by Alison Cross is tight and intelligent, thankfully focusing more on relationships than Cammermeyer's trial, and Bleckner allows the two actors to create a subtle interplay. Close has fun with the butch army stereotype and is moving when she confesses to her sons, her tears bursting forth.